Whew. That was a close one. The kids are back in school. It was a loooooong summer of family vacations, family car rides, family dinners (and breakfasts and lunches) and family everything-elses. If absence makes the heart grow fonder, overexposure makes you want to boot the kids over yonder. Working from home makes this doubly true. So, hooray for school! Picky palates – Hopefully you are blessed or patient enough to have kids that aren’t too picky about their food. Being able to think outside the Hot Pocket is a real help here – not least for the person doing the meal prep. You can still make it work if they only want to eat white stuff, or have none of the disparate food items touch, or only do the PB&J thing – but it’s not a whole lot of fun. Enforcement – I make my kids turn lunch boxes into the kitchen the second they walk in the door after school. Not only am I not hunting them down later, if they didn’t finish something it can quickly go into the fridge for the next day. If they forget to turn the lunchbox in, it’s back to whatever a “chicken chili roll-up” is for a day. Yes, school lunch is a punishment for being lazy/forgetful. I like to think we’re building better habits via the threat of lame cafeteria food. Everyone has their thing. 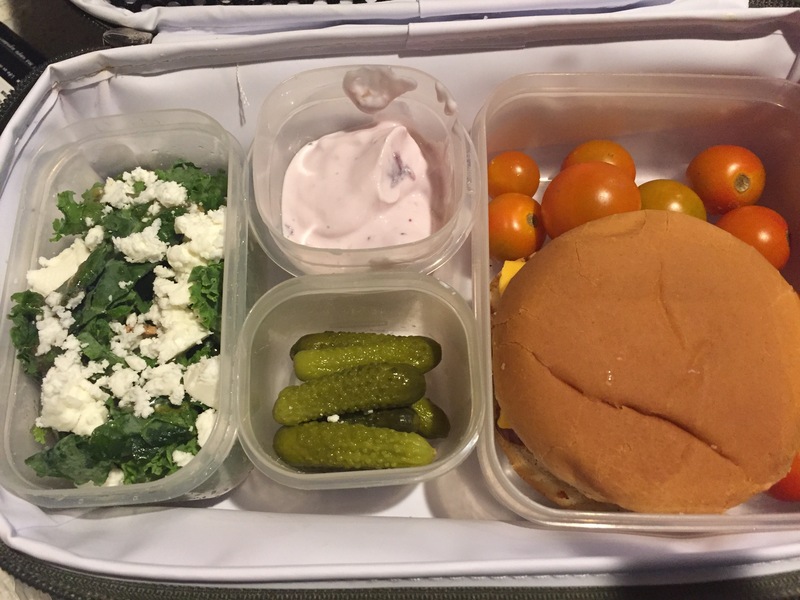 Survey and prep – Ask your kids what they’d like in their lunches and take that into consideration (even if you don’t take it as gospel). Take them to the grocery store with you. Prep them just like you’re prepping the lunches. Tell them over breakfast that the “weird looking” stuff going into one container is ricotta, roasted sweet peppers and cherry tomatoes and that they’ll LOVE it. They’re less likely to turn a nose up at lunch if they know what’s going on. You might have them help pack the lunches, though my daughter would go to school with two pounds of Cheez-Its everyday if left to her own devices. She does not get to help. 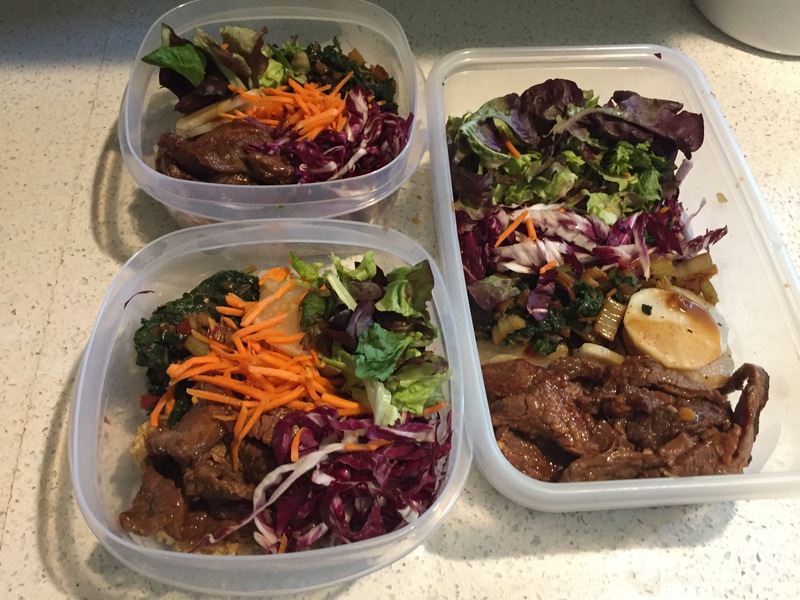 Bulgogi bowl lunches and dinner for two. Packaging – Because you’re not an Earth-hating jackwagon you don’t plan on packing all their food in disposable plastic bags. Right?!? So invest in some good plastic food containers, BPA-free if you want. How much should you buy? Here’s a handy exercise: Get a number in your head – got it? Triple it. Should be a good start. Some will get lost, some will be drafted into household leftover duty in the fridge, etc. If you don’t buy enough you’ll be back to disposable bags or giving up entirely. I recommend the Rubbermaid LunchBlox line. They stack well, are sized right for sandwiches and whatnot, fit easily in our lunch boxes and come with a fitted ice pack. PS: Order extra 1.2 cup side containers (at right)…you’ll use these suckers for everything. On the run – No matter how much you prep and plan, you’ll always oversleep once in a while, overserve yourself at Shakespeare’s the night before or just generally have all hell break loose. 10 minutes before the bus pulls up is not the time for a fancy pasta salad. Grab some lunch meat, a block of cheese and get to work. Throw in some crackers and you’re pretty much set. The cure – Yes, freezer packs work great. But humans have been curing and pickling things for thousands of years for a reason – it keeps things fresh and tasty. Generally, this segment occupies two chunks of the food pyramid or MyPlate (or whatever other gimmick the USDA is trying out now to get the mouth-breathing masses to not eat actual garbage) and can make up the bulk of a proper school lunch on most days. You can’t go wrong with a selection of Volpi or La Quercia meats from the grocery store, but you’ll have a lot more fun dropping by the butcher shop section of Barred Owl. They have a kickass array of cured goodies – from good old salami, ham and turkey breast to saucisson sec and patés – which will make many kids happy and you feel like a better parent than you really are (do not discount the value of starting off your day with this last element). Also guys, Barred Owl’s beef sticks are magical. Plan ahead – This is probably the most critical element to a successful school lunch operation and you don’t need to be a Marine quartermaster to make the logistics work. Twice a week, make extra servings of dinner and prepackage things for school a day or two later (I recommend skipping a day…kids can burn out on even tasty stuff if eating it multiple times in a row). Think about what can work cold, since the kids – at least my kids – don’t have access to a microwave to warm things up. For instance, this Tuesday I made a hefty 8-10 servings of chicken kebabs and that stuff was dinner that night (Tuesdays feature a meeting downtown, karate practice and soccer in St. Louis), lunch for one kid on Thursday and dinner for the other that same night. Korean steak rice bowls (pictured above) have been a huge hit. 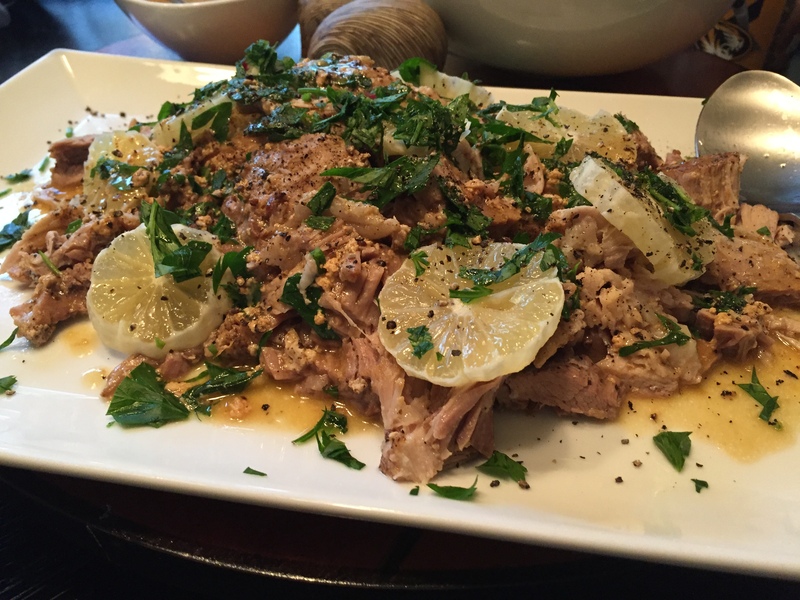 A dinner of milk-braised pork shoulder (below) got worked into sandwiches one day and a kind of meaty pasta salad a couple of days later. Make a big batch of brown rice every few days…make it easy on yourself. Vegetables – Machined carrots with ranch dressing are fine once in a while, but they’ll wear out their welcome pretty quickly. Kale salad with Greek dressing and feta does yeoman’s work at least once a week around here. Cornichons, pickled green beans and regular old pickles pop up frequently as well. Frozen or canned peas tossed with olive oil, salt and pepper seem boring to me but the kids dig ’em; so too, frozen edamame. Cherry tomatoes are nature’s candy, folks, and available by the bushel at the farmers market right now (I recommend Happy Hollow’s in particular). Fruits – Mangoes have been a dollar each at HyVee for a couple of weeks, and we’ve been going through at least one a day. Bananas are great but can be tough to keep from turning into a pulpy disaster, so we go more with apples. Chop a cantaloupe and parcel it out over a few days. Make a smoothie. Throw a kiwi into the mix – go crazy. “Healthy” stuff – Somewhere along the line we decided yogurt was healthy (great brainwashing job, yogurt manufacturers!). Hint: most of it really isn’t. Loaded with sugar, the majority of the yogurt in the grocery store is just a step or two short of a can of soda. Still, a quarter cup of Chobani with some fresh fruit mixed in isn’t going to kill anyone. Granola bars are in the same boat, but Bobo’s Oat Bars and the Junkless brands are better than most. 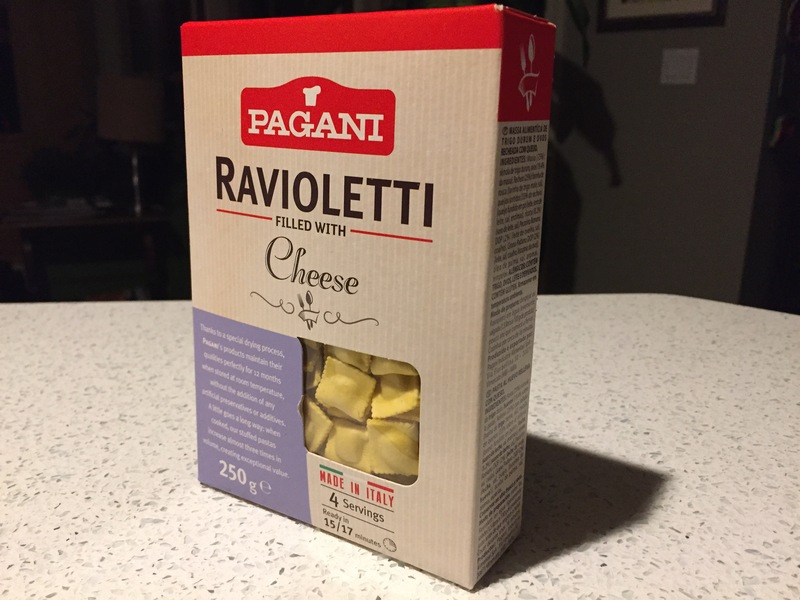 The kids are going bonkers for this stuff and I can’t blame them – pretty solid little ravioli I found in the pasta aisle at HyVee. I boiled it up one day and it’s been in lunches (and traveling dinners) ever since, tossed with olive oil, chopped salami, arugula and cherry tomatoes. Good stuff.